When I was on the ground, I constantly questioned the usefulness of my presence. I photographed people dying, to show them to those who let them die. «Details bored Antoine d’Agata. The reality is the men and their trials. Here, there is nothing like a haunting documentary concern or a complex construction. The project simply reports activities like walking, eating, staying warm and sleeping. The everyday life of a world in-between, made of nomadism and inertia. Hence the intensity, the density of sequences that couldn’t be told in any way. The linear narrative is absent. Antoine d’Agata is the photographer who’s the most stubbornly photographer ever. Still he persists in his pursuit of another corporation. This business can’t be practiced without values. 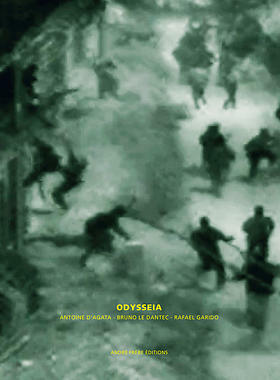 – A text by Antoine d’Agata, Bruno Le Dantec and Rafael Garido based on statistical datas about European immigration. – Photographs and images from the video recordings.